Blake Morant, the dean of the law school, announced Monday that he will resign at the end of the academic year. The dean of the law school will step down at the end of the academic year, according to a University release Monday. Blake Morant, who began his tenure at the head of the law school in 2014, will return to the University as a faculty member after he goes on sabbatical, according to the release. Morant is the fourth top administrator to leave the University since the start of the year and the second dean of a school to announce his resignation in less than three weeks. 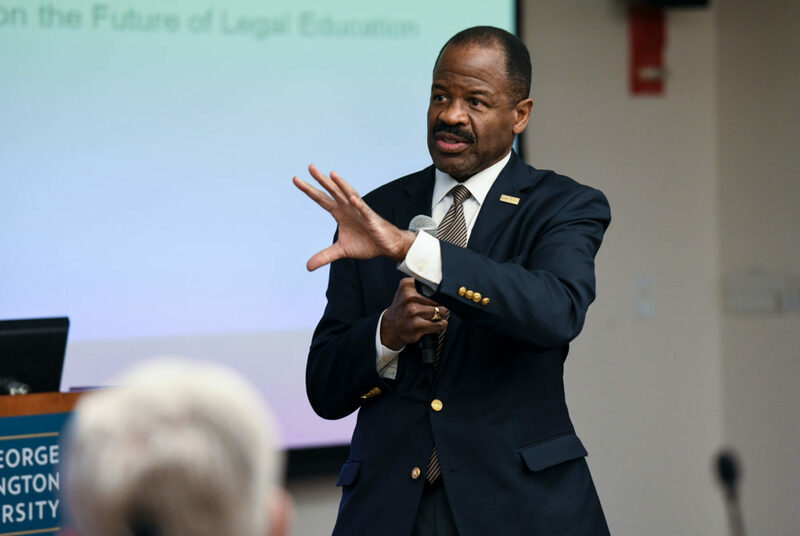 “During a time of significant challenges in American legal education, it has been a privilege to serve as the law school’s dean,” Morant said in the release. During his tenure, Morant oversaw a surge in applications to the law school after officials decided to scrap an $80 application fee in 2017, contributing to a 9 percent spike in applications that year. Officials decided to enroll fewer students from that pool in an effort to boost incoming students’ average GPA and test scores and stop the school’s slide in U.S. News and World Report rankings. The next application cycle, the law school received nearly 7,700 applications – the highest in seven years and the second-highest of all law schools across the nation. Morant also focused on initiatives to promote diversity and inclusion during his roughly four years at the helm of the law school. The school announced a new administrative position in 2016 to focus on wellness and inclusion and a year later instituted faculty and staff training about LGBTQ identities and implicit bias training for staff in the career center. But at the time, some faculty said they had not heard about the new diversity initiatives. His administrative endeavors also included the launch of a new academy in 2016 that gave second- and third-year law students the opportunity to attend panel and speaker events and be mentored by industry leaders, entrepreneurs and investors. He also oversaw the rollout of the law school’s Office of Alumni Career Development and Mentorship last fall, which provides law school alumni with career and counseling services. Morant also currently serves as the president of the Association of American Law Schools Fellows Program. Morant recently spearheaded the law school’s first curricular overhaul in more than three decades. The new changes, slated to go into effect this fall, increase the number of credits in the school’s Legal Research and Writing Program and add a new course focused on lawyer-client relationships. “During his tenure, Blake not only elevated the status of the law school, but he also brought focus to great scholarship and practical experiences for our students,” University President Thomas LeBlanc said in the release. But Morant also led the school through some trying times. Under his leadership, the school announced and then quietly reversed its decision to accept Graduate Record Exam scores last academic year after officials decided to complete a self-study before accepting the test. The dean also found himself in the middle of a student conflict last semester after the president of the Student Bar Association was accused of making insensitive comments about a Jewish student group. Morant contacted members of the SBA and the Jewish Law Student Association last semester offering mediation sessions to resolve the issue, but some students said the effort aimed to lessen the severity of the incident and avoid bad publicity.